I was after this for such a long time after originally wanting the clarisonic. I read lots of reviews of the clarisonic and was convinced it was what I wanted in my life and then I heard about this little fella. It’s basically the same as the clarisonic, other than the fact that it is made from non abrasive silicone which is nonporous and obviously waterproof. It is about £20 more expensive than the Mia 2 (the one I wanted). This is the full size luna although you can get a mini one which is the same price as the Mia. It may be slightly more expensive but there is not as much upkeep as you do not need to keep buying replacement brushes, as you would with the Mia or Mia 2. I have the version for sensitive to normal skin although you can also get one for ultra sensitive skin and then one for combination skin. They have different sized and shaped touch points to suit your skin type. The cleansing side of the unit and it has lots of silicone touch points so it is super gentle but still feels like it’s actually doing something. It doesn’t just ‘feel’ like its doing something, I can see that it is doing something. My skin has always been pretty good but often get spots under the skin and some redness but my skin is so clear, soft and clean now! Worried about charging when travelling? Don’t. One single charge will last 450 uses. It also comes with a 2 year limited warranty and a 10 year quality guarantee. I might do a video on how to use this at some point if you would be interested but for now, I’ll just explain. You select one of the 8 speed t sonic pulsation speeds and then I wet my face and pop a small amount of cleanser between my fingers and then rub it over my face. I then wet the device under the hot tap and apply a tiny amount of cleanser on the actual silicone bristles and then you just turn it on. You use the device for two minutes and it vibrates in intervals so you know when to move on. You start on one cheek and then the other and then the forehead and then the nose and chin together. On the reverse of the device, there are these grooves which are used for anti ageing, you turn it onto the lower frequency and you press it against the outer parts of your eye, then between your eyebrows and then on your smile lines. This is supposed to reduce fine lines and lift by working in the same kind of way as a facial would. Similarly to the Clarisonic, it vibrates for a period of time and then buzzes, the buzz signals the time for you to move to the next ‘checkpoint’ of your face. Overall, I am so happy that I have this, even after the short period of time that I’ve been using it, it has already made a huge improvement on my skin and am nothing but impressed with it. As I’ve grown up a bit, I have started to spend a little more on skincare as I think really do get more for your money and sometimes you can be left a little disappointed because it doesn’t live up to your expectations but that it’s definitely not the case with this product. It’s amazing and if you are sitting on the fence then I urge you to get it. 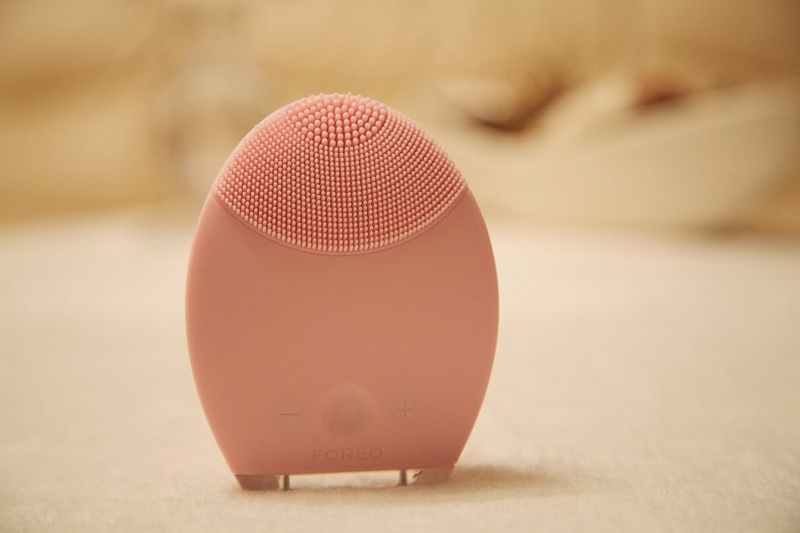 The Foreo luna can be bought here for £145. The Foreo Luna Mini can be bought here for £99. This does sound pretty good, not sure I can afford the price tag though! For that price, I would hope that it works well. It kind of looks like that pink Pokemon that carries around an egg. we've never heard of this device before, we'll have to look into it. It is quiet pricey though isn't it? we hope it works well!! Did you notice a big change in your skin after using this? This is so cool, i really wanna try it out!